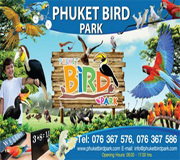 " Phuket Gateway has built as the first drawing room and a new tourist attracting and facilitating for visitors coming to Phuket. 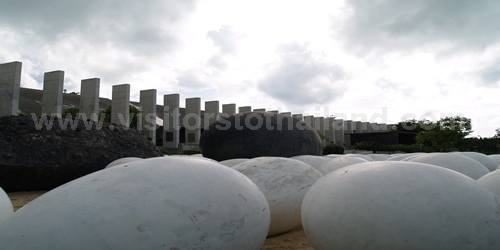 It is located at Tha Chatchai, Mai Khao sub district, Thalang near Thao Thepkasattri-Thao Srisoonthon Bridge. 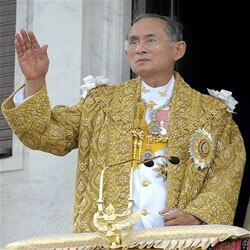 The Phuket Gateway has completed in 2007 on the occasion of King Bhumibol’s 80th birthday anniversary. 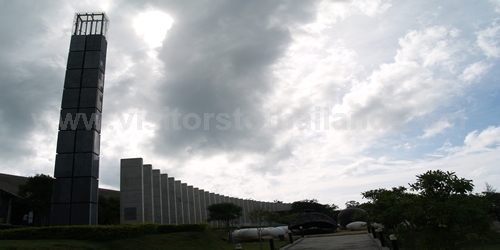 The content of this building is to create a striking and spectacular carving to warm welcome visitors who arrive on Phuket on vehicles driving by yourselves. 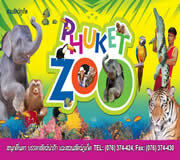 Unfortunately, a few foreigners visit but many tourists arrive or depart by air cause Phuket International Airport is south of Phuket Gateway. It is a reason why no one sees and knows it. 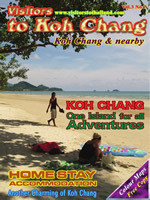 Tourists might pass by on a tour operators to Phang Nga province for snorkelling or diving on time table etc., but the tour bus had never visit there. So pity, it is a really nice place to stop for a look. 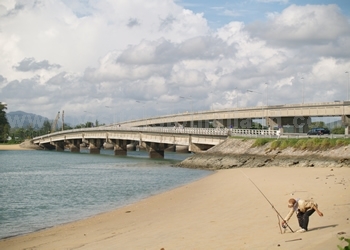 Thus, if you are going out Phuket Island or coming over the bridge from Phang Nga, it is worth for a stop, you might even learn something about Phuket here! 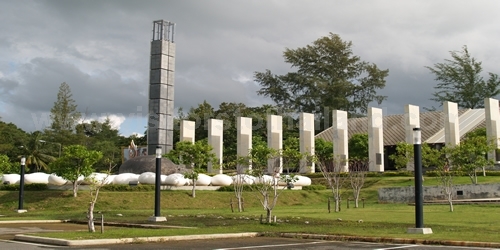 The main feature of the Phuket Gateway is a story of 29 pillars. 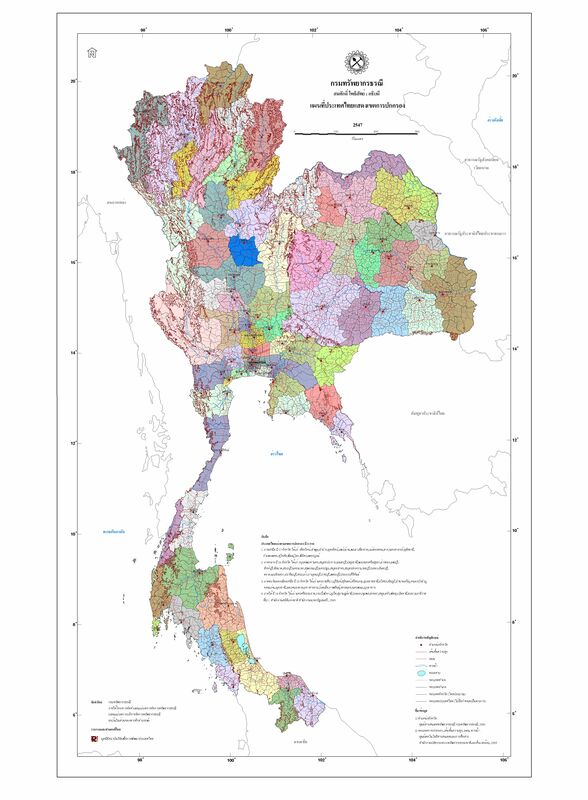 The numeric of "2" and "9" that composes of "29" is not a normal meaning, but there is a special answer of two digits – the first numeric is “2” it presents the two heroines in the war with Burma in 1785 i.e. 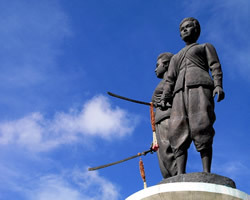 Thao Thep Kasattri and Thao Sri Soonthon who are standing elegantly on the monument off Thep Kasattri road. 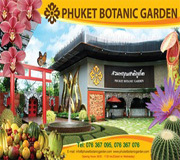 Each pillar includes an engraved plaque, each one writes a little of history and local cultures of Phuket. 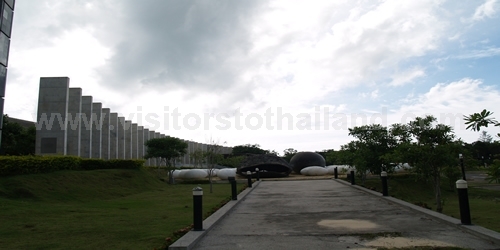 Look, visitors can learn some things here! 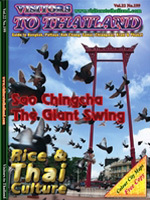 In the area, there are Phuket Tourist Information Center, Mini Theatre which provides a way of Phuket life and documentary of Thailand and also world tourism by multimedia technology, library that offers many appearing information and “Kopi Corner” a relax coffee corner with local snacks and beverages. 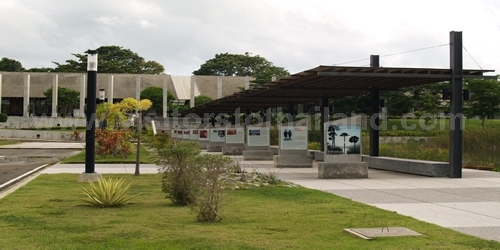 The monument covers with many tropical gardens, which is a nice place for a picnic or relax and drink some cool beverages under the shade.